After walking over to check out the source of the music, we saw a stage and a few stalls set up to promote the Taste Georgia event. The traditional costume-clad men played lute-like instruments called chonguri and sang beautiful folk songs. Stalls around the stage offered hand-made clothes and accessories, promoted tourism to Georgia and celebrated sporting achievements of Georgian athletes. The food stalls, set up by The Georgian restaurant, had a range of tasty-looking Georgian food. 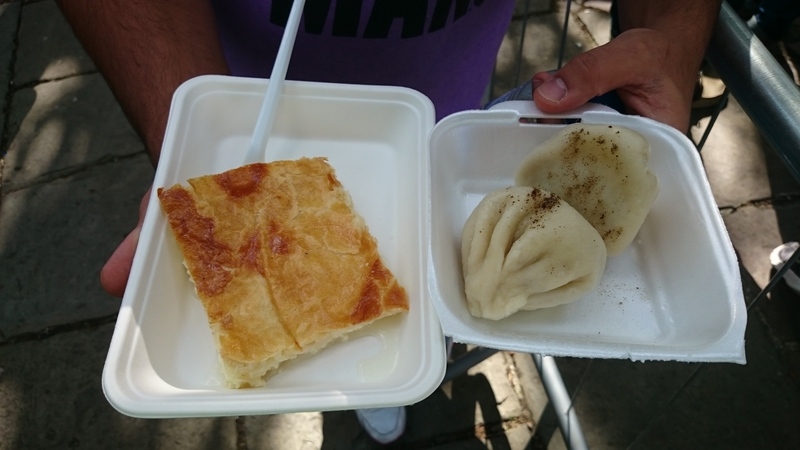 I decided to go for the khachapuri, a staple of Georgian cuisine. This cheese-filled bread was hot and fluffy and reminded me of a light pastry. I also had some khinkali, traditional meat-filled dumplings. They come in a number of varieties and mine were boiled, but it’s possible to go for a steamed option. I’ve actually visited Georgia twice when I was a kid and the food and the music reminded me of my childhood. I remembered the rolling mountains on my train journey from Tbilisi to Poti and beautiful architecture in the historical centre of Tbilisi. This definitely put Georgia back on my travel list! Check out http://www.exploregeorgia.org/ to learn more about Georgia and I will try and feature Georgia on the blog in the future! This entry was posted in Europe, UK and tagged england, food, London, photography, travel, UK, wanderlust.